Sorry to hear you had problems with the activation. Please send us an email to support@pinpoint.world and we will help you activate and set up the plugin. Thanks for the fast answer and your concern. I’m just evaluating some plug-ins and I’m still learning wordpress, so maybe I did some mistake. For continuing by mail, if you don’t have any problem I’d keep this topic public so everybody reads it can solve the problem as well. I un-installed the previous installation and reinstalled it more times now, but the result is every the same: when I click on Activate the error is there. I have built a little animated PNG file that shows the whole process I did. 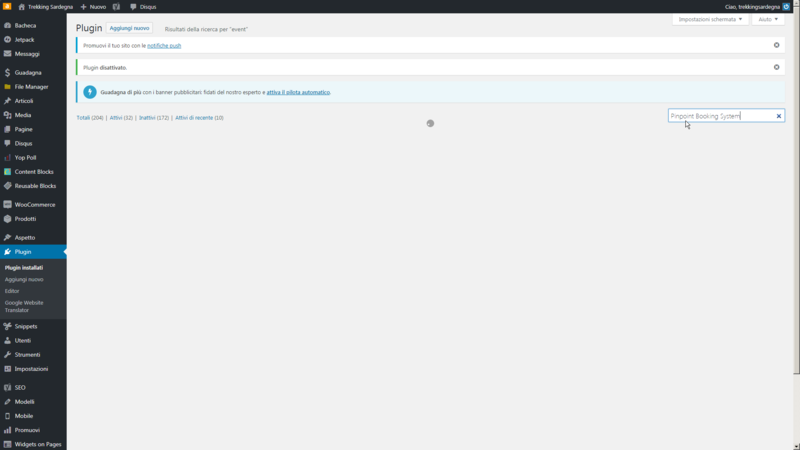 The wordpress UI into the animation is in Italian, but wordpress is pretty standard, so I’m sure it won’t be an issue. This reply was modified 4 months, 1 week ago by BatCar. This seems like an incompatibility with another theme or plugin that you have installed. It will really help us if you have an error log on your server. If not you can install Query Monitor Plugin to view the exact error that is given. Ok I just installed Query Monitor Plug-in as asked. But I don’t know it, because I never used it before, sorry. How do I proceed to give you the information you asked? Would you please guide me step by step until I get familiar with it so I can give you a targeted answer? How do I set Query Monitor? What do I need to do to generate the log you need (for example do I need just to repeat the same operations already done, I mean just un-install and re-install again Pinpoint or something else)? Where do I find the log to show to you? I apologise in advance for my ignorance and for the trouble I’m causing you, and thanks for the patience. 1. Install Query Monitor like any other plugin. 2. Install Pinpoint Booking System and the error will appear on top with red. Just copy it and paste it here. – Pinpoint installed OK, but activation is not OK. The resulting error appeared is the same as before. Is this the message from Query Monitor? This reply was modified 4 months, 1 week ago by DOTonPAPER. appears a kind of pane: here there are really a lot of items and infos separated by tab-pages. Some infos are red. Yes, that is the right location. We need the PHP Errors after you activate our plugin. A screenshot were to find them after activation (top fixed admin bar). Notice that I screenshotted everything else in all tab pages: if you wish I can create a shared folder with all images or I can even create a videoclip or an animated png image to share with you containing all of them, in case you need to have a look on the content of all other tab pages. But if I might, I’d prefer to share a log file in txt format, this way it would be searchable and easy to spot what needed. But at the moment I don’t know how to save a report into a txt/log file… My apologies. If you think it is a better idea about txt/log file I need a hint about how can I do it with Query monitor. With Query Monitor, after you activate our plugin, on top in admin bar click Query Monitor and PHP errors and the error will appear in the panel from your screenshot. Is that error related with the fatal error generated by Pinpoint failed activation? Can I do anything else or do you have everything needed? The Query Monitor plugin is the alternative to changing the wp-config file. The only way we can determine what causes the fatal error is to catch it when you try to activate the plugin. With Query Monitor installed you have a way to see the errors without changing the code. Basically, when you click ” Activate plugin ” the Query Monitor should change the color to red, indicating that you have an error. If you click on it you should be able to see that error (or multiple errors). From the looks of it, you made a screenshot of the Query Monitor when everything was working. Those 2 deprecated warnings don’t cause problems ( warnings/notices don’t, only errors do). Please try again when you activate the plugin. This process can go much faster. If you want, please create a new user to your website and write to us at support@pinpoint.world. We can find the problem much faster. I suppose you are going to need a user with admin-like privileges because you need to be able to install and activate plugins and check for instance what query monitor returns into other tab-pages. Am I right? This reply was modified 4 months ago by BatCar.